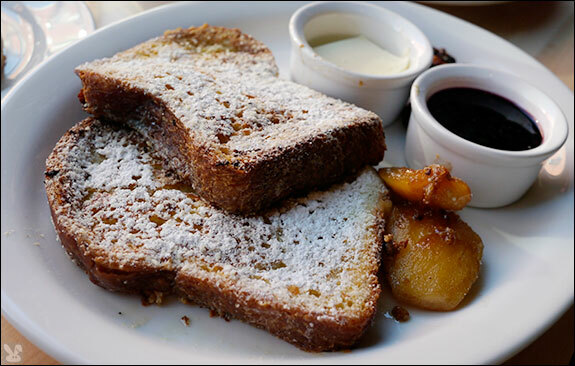 To make this dish more commemorative, the toast should be served with cotignac, a French quince marmalade paste that is an Orleans specialty. This extraordinary preserve was once flavored with musk and presented as a gift to visiting royalty. When Joan came to lift the siege of Orleans, cotignac was the first gift presented to her. Quinces or winter pears were one of the most popular fruits of the middle ages. The fruit is extremely sour and was primarily used in jams and marmalades. The best quinces come from Portugal and the Portuguese for quince is marmalo. Marmalade is based on the word marmalo since the first marmalade was made with quinces. Beat together egg and sugar; add milk and nutmeg. Wash the quinces to remove the 'bloom', then chop and place in a pot. Add the lemon juice and apple pips. Add enough water to barely float the fruit - at most, barely cover the quinces. Peel, core and slice quinces. Put 4 peeled, sliced and cored quinces into a pan with water not quite covering them. Bring them to the boil and cook for 30 minutes. Strain through a colander, then the resulting juice through 2 thicknesses of muslin to extract as much juice as possible. In the quince juice cook another 6 peeled, sliced and cored quinces, prepared oranges, skinned and Simmer for 1 hour, and put the mixture through a sieve, so as to obtain a thick puree; weigh the puree, add an equal quantity of sugar, return to the pan and cook until the mixture begins to come away from the sides. Allow to cool and store in jars and refrigerate.